”This is a wonderful collaboration between an adult choir and a children’s choir presented in the excellent acoustic of St. Andrew’s United Church. 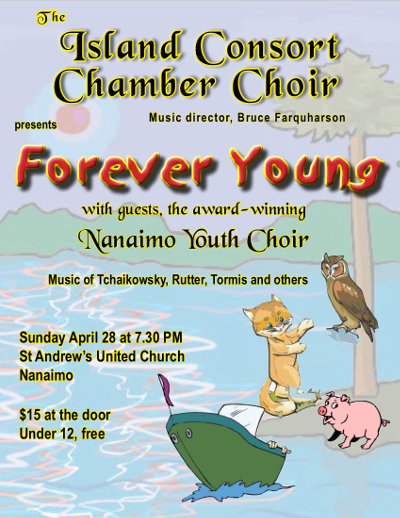 “Forever Young” features music by Di Lasso, Tchaikowsky, Saint-Saens, Barber, Tormis, Rutter and others. Focusing on youth and the young, the repertoire includes titles such as “The Cherubic Hymn” and “Five Childhood Lyrics”, and includes a zany pair of speech choir selections from Bergmann’s “Galgenlieder”. The concert will end with both choirs combining to sing Humperdinck’s beautiful “Prayer” from Hansel and Gretel.